Matthew Neale, a writer who has already won the Whitbread Book of the Year award in 2000 for his book English Passengers, had this week’s review book published in 1987. It was republished in 2002 in paperback format (ISBN 0-75381-306-8) by the Phoenix group. The plot revolves around a very young (and immature) Englishman, who has found himself in Japan, working as an English teacher in a shady language school in an even shadier area of Tokyo. The English teacher is having a live-in affair with a Japanese girl, Keiko, and as an example of the cultural void between the two, it is repeatedly brought to the reader’s attention that the 30 year old Keiko has an affinity for stuffed toys, Mickey Mouse and wears Mickey Mouse socks. Since one of the senior people in this newspaper’s hierarchy also wears Mickey Mouse ties, I would be loathe to comment on this; it should suffice to say that I believe the average adult would not be too taken aback by Mr. Disney’s expansion into the sock industry. Most of the book is taken up with the tale of how Keiko’s family are trying to entice the English teacher to marry the young woman, and much is made of the family’s ‘strange’ business, which is held from the reader till the end, but to put you out of your misery, it turns out that they have strong underworld ties and run brothels. Oh dear me! Yawn! The rest of the book has a sub-plot, within which the English teacher tries, very unsuccessfully, to wrest his agreed upon salary from the woman who runs the language school. She hides behind her husband, who is portrayed as the one who will not cough up with the requisite number of yen, even though the lady says she has the yen to pay up (take that pun any way you like)! Side tracks are few, but include the English teacher finding the language school husband in the brothel (which is owned by the prospective in-laws, yawn again), but the poor sap hasn’t the gumption to accost the man and extract the money by the time-honored method of extortion. Oh yes, there is also an official from the Immigration Department who claims to work for the bank, but who tells the English teacher to leave Japan because the prospective in-laws are outlaws! It’s all too much! Mr. Foreigner is a slim book, and I was able to read it easily in one afternoon. For me, it showed its age. Perhaps in 1987, Japan was sufficiently mystical, and the Japanese people sufficiently inscrutable, to get away with what I felt was a rather thin and purposely obtuse plot. It left too many questions unanswered. The shrinking nature of the world in the past 15 years makes vague cultural symbolism look like poor researching, rather than stimulating interest in the intrigue of the Orient. The writing style is slick and foretells of literary excellence - later - but Mr. 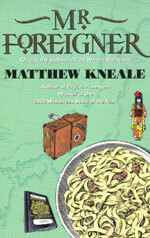 Foreigner was too early in Matthew Kneale’s career for my money. At 395 baht it will not grace my bookshelves. Anything that is titled “Best Of” is always suspect to the usual problem of why isn’t so and so on it or what is so and so doing off it. Well let’s get that bit out of the way. Firstly, in this Dog House Best of any Pink Floyd album would contain “Saucerful of Secrets” from “Ummagumma”, “Reemergence” (the end of Atom Heart Mother) and “Mudmen” from “Obscured by Clouds”. And certainly would not include the dreadful “When Tigers Broke Free” who’s only inclusion must be because it’s not available anywhere else on CD, as it has only ever been released before as a single (failed) in 1982 from additional material written for “The Wall, The Movie”. Also, nowhere on a ‘Best of Pink Floyd’ should there be anything from the awful last album by the Roger Waters led Pink Floyd “The Final Cut” represented here by the extremely boring “Fletcher Memorial Home”. Still, enough griping, the rest of the two hours thirty-five minutes you get here is wonderful. Three from “Piper at the Gates of Dawn”, “Set the controls for the heart of the Sun” (the only track ever recorded by Pink Floyd as a five piece, before the lovable, but totally mad Syd Barret scuttled off into the sunset) and “Jugband Blues” from “Saucerful of Secrets”, “One of these days” and the mighty “Echoes” (magnificently edited down to a more manageable seventeen minutes from the original twenty three, although keeping all the beeps, bonks, clangers and David Gilmour’s soaring guitar solos - probably amongst the best he ever laid down in the studio) from “Meddle”, fortunately the best half of the tracks from “Dark Side Of The Moon” (five in all), two from “Wish You Were Here”, one from “Animals”, four from “The Wall” (about as many as you need, lets face it when you are “Comfortably Numb” who cares), and four tracks carefully selected from the last two Waterless albums (Momentary lapse of Reason and Division Bell). But unfortunately nothing from their 3 wonderful live albums. Altogether this proves that Pink Floyd still reign as the finest band in space, best of all though is that the album is topped and tailed by two fine Syd Barret songs, which not only bring a bit of light to the generally gloomy Pink Floyd thoughts, but should hopefully bring a few pennies into Syd’s coffers as I’m sure they will be more than welcome, at his reclusive home in Cambridge. Disc two climaxes with the soaring “High Hopes” which looks like being the final expression of their moody majesty, the last track from the last Pink Floyd album. But there’s one final twist in the tale as the closing chord decays, a bell rings and up pops Syd to sing “Bike” - a genuinely cheerful, pleasantly bathetic coda to a brilliant career. Which is what makes this such a wonderful “Best Of” as songs from 1994 slip faultlessly into 1967 songs without missing a beat. Wonderful, that’s Pink Floyd. Bye bye. Thank you for sharing. Have a nice retirement.